while the cow, sheep, and horse swam in the sea. and goes and returns by unaccustomed routes. 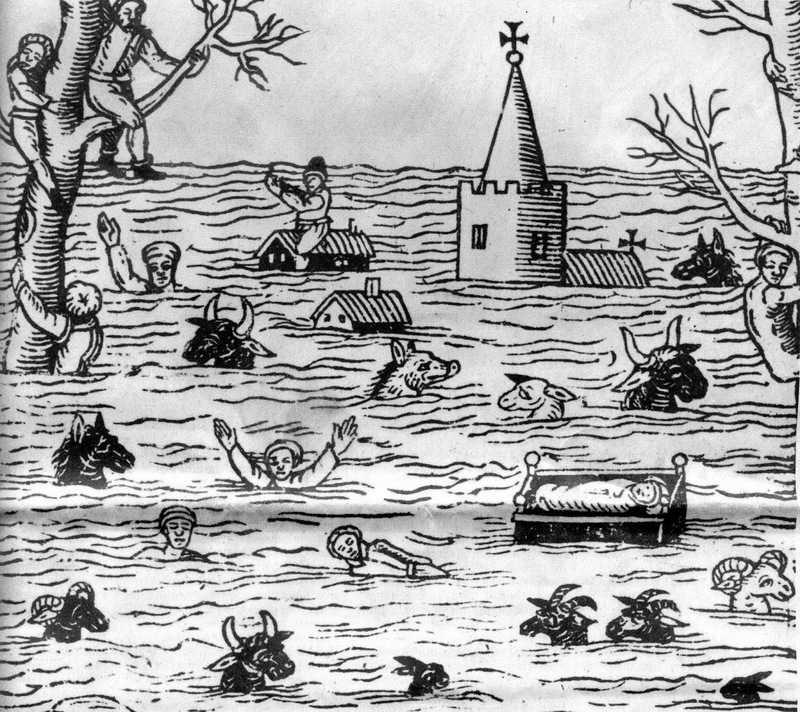 Woodcut of the disaster, showing the church of Nash surrounded by water. It was one of those days. Living on the coastal flood plain is always chancy. You are only as secure as your flood defences, and on this day, those defences weren’t good enough. The sea broke through, and flooded the low-lying levels around the Bristol channel, even encircling Glastonbury. As one commentator later wrote, Men that were rich getting out of bed in the morning, were poor before noon the same day. Possessions, land, buildings, they were gone. For others it was much worse. The water came without warning, submerging farms and towns. Perhaps 2000 people died, unable to flee from the floods. More than 400 years later, this still ranks as the UK’s worst flood disaster. Even without the flood, these were memorable times. The controversial King James was on the English throne. Guy Fawkes had just tried to blow up parliament, which for unfathomable reasons is still celebrated in the UK, on November 5. The King James bible was being written, and Shakespeare performed in London as one of the King’s Men; his plays already famous. In these exciting times, the news from the west country still caused upset. The date of the disaster can seem unclear. Some records give it as January 20, other as January 30, and the year is given as 1606 or 1607. A few people have suggested that there must have been more than one event. But the explanation for the date confusion is prosaic. This was some time after the catholic church had initiated a new calendar, with fewer leap days and shifted by ten days. The old calendar had slowly gone out of sync with the seasons and by this time the difference had become notable. The Gregorian calender replaced the old Julian one, and was a clear improvement, but it suffered from one major draw-back: it was catholic, at a time of strong protestant movements in northern Europe. Therefore, many were slow to adopt the new enemy calendar. England in particular had held off, even in those days already being wary of new-fangled continental innovations. So Bristol still used the Julian calendar – for them the date was Jan 20. But many people in London, perhaps more progressive and certainly more international in their outlook, had started to use the Gregorian calendar in use in France and Spain – so here the date was commonly (but not invariably) listed as January 30. How about the year? That seems harder to get wrong! But in the Middle Ages, the year did not start in January, but at Easter or the onset of spring. This had ancient roots. The Jewish calendar, the oldest for which we have written records, originally started each year in spring. (It changed later to start in the autumn, probably during to the Babylonian era as Mesopotamia had always used this system. The Jewish scriptures use both systems, some predating and others postdating the change-over.) The equinoxes are convenient, by the way, because the position of the Sun on the sky changes rapidly at these times, so the precise date can be measured easily. They are also more important than the solstices for agriculture. During the Middle Ages, the start of the year was normally taken as March 1, although this was not universally accepted. The Gregorian calendar confirmed January 1 as the start of the year. Some regions which had not accepted the new calendar did accept the new beginning. So late January was 1607 according to the new system, but still in the previous year, 1606, according to the old one. Any newspaper called ‘The Times’ would have had to specify which times. It all happened around the Bristol channel, which separates the southwest of England from Wales and forms a funnel aimed at the heart of England, the Cotswolds. This was one of the invasion routes considered by the Spanish. The funnel narrows until it becomes the Severn estuary. The funnel shape, and the fact that it has just the right length to act as a resonator, causes an extreme tidal range, which is one of the largest in the world. Beyond Bristol, the estuary becomes the river Severn, which is the longest river in the UK (Bristol itself is on a different river, the Avon). The Severn is famous for its bore, a solitary wave running upstream with the tide. On both sides of the Bristol channel there are extensive low-lying areas. On the north side are the low-lying area around Cardiff and Swansea in Wales. On the south side are the Somerset Levels, an area still prone to river flooding today. A number of towns had sprung up around the channel, some Roman in origin (Cardiff), some Viking posts (Swansea), some medieval trading centres (Bristol). The flood plains were extensively farmed. There were sea defences, but they were not in as good a shape as they should have been. This was in part because of the dissolution of the monasteries: these had been responsible for some of the upkeep, and the new owners did not take on these responsibilities. The flood plains were a sitting duck. This was in the Little Ice Age, and storms were more frequent than they are nowadays, with perhaps the storm tracks running further south. On this day, in the early morning of January 30, the sea rose, and kept rising. By 9 am the dikes crumbled or were overtopped. The sea did not quietly accept its boundaries – water is a jealous neighbour. Appledore is an example of a seafront town affected by the flood. It is located on the river Taw, just downstream from Barnstaple, the first place along the Bristol Channel to feel the incoming surge. As the waves came in, houses were swept away. It appears the entire sea front was destroyed. The houses along the shore were not rebuild for a century afterwards – the memory ran deep. Appledore and Barnstaple form a low-lying inlet in a hilly landscape. The flood moved up the river and flooded the inlet but the areas a bit away from the river were uphill and stayed dry. However, Barnstaple was hit hard; a few hundred people reportedly perished here. The 20th of Jan 1606-7, by reason of a great tempest, the sea brake in at divers places on the north side of this country, as at Barnstaple, where was much hurt done. At Bridgwater two villages near thereabouts and one market town overflown, and report of 500 persons drowned, besides many sheep, and other cattle. At Bristol it flowed so high that divers packs, which were brought thither against Paul’s fair, standing together in a common hall of the city, for such purposes, stood three foot deep in water. Around Cardiff, on the Welsh side of the Bristol channel, many low-lying areas were flooded and the water reached into the city. The nearby, flooded areas were sparsely inhabited at the time (nowadays they are densely packed suburbs). The main church in Cardiff, St Mary’s Parish Church, became undermined by the water. Over the following years, the church was slowly abandoned in favour of a sturdier one, although it remained in use until after 1700. Further east, some populated areas were wiped out: here, only the churches, complete with flood marks, remained. The flood came in furthest in the Somerset Levels, a flood plain protected by less than solid dykes. In other places, the surge traveled up the rivers, reaching the centre of Bristol and flooding the area around the river Severn as far as Gloucester, the very area where nowadays surfers tackle the famous Severn bore. Based on the flood marks on the churches, the water reached over 7 meter above AOD (Ordnance Datum) on the Welsh side, and over 7.5 meter on the Somerset Levels. This is actually not as high as might have been expected, as this would have been about the peak tidal level and the surge must have been well above that. The suspicion has been raised that the land has sunk by 1-2 meters since 1600, due to the improved drainage. Others argue that the tidal range has increased but there is no evidence for this and it seems too speculative. Perhaps the people putting up the markers were conservative in their estimates. Th St Mary the Virgin church in Nash, depicted in the woodcut at the top of the post. Comparing the woodcut of the flood with the modern view of the same 12th century church (Nash, Newport) gives an indication how deep the flood was. However, one should allow for some artistic license of the maker of the woodcut. The flood marker is near the door, ‘only’ about 1.5 meter above ground level, but it is small and indistinct and it is not clear that this actually is for the 1607 flood. The 1607 flood made the news once more when Haslett and Bryatt proposed that it had been caused by a tsunami. The disasters in Indonesia, Sri Lanka, and Japan over the past two decades have shown the devastation a tsunami can cause: the power of water is immense, and in the cities that were affected by tsunamis, almost nothing was left standing. This video is one of the scariest of the 2011 Japan tsunamis, starting with people horrified by a distant disaster unfold and ending with blind panic. Then they might see & perceive a far of as it were in the Element, huge and mighty Hilles of water, tumbling one over another, in such sort as if the greatest mountaines in the world, has over-whelmed the lowe Valeys or Earthy grounds. Sometimes it so dazled the eyes of many of the Spectators, that they immagined it had bin some fogge or miste, comming with great swiftnes towards them: and with such a smoke, as if Mountaynes were all on fire: and to the view of some, it seemed as if Myliyons of thousandes of Arrowes had bin shot forth at one time, which came in such swiftnes, as it was verily thought, that the fowles of the ayre could scarcely fly so fast, such was the threatning furyes thereof. A large, local tsunami can also be caused by a major landslide. In fact the highest tsunami ever recorded was caused by a landslide, triggered by an earthquake: the 1958 Lituya Bay tsunami, with a run-up height of over 500 meter! The video is about this event. But again, there is no evidence for such a landslide within the Bristol channel. As an aside, tsunamis can also be generated by volcanic eruptions, in a variety of ways. The volcano may suffer a flank collapse, sending a huge slide into the sea . There may be a large explosion in shallow water. And finally, a descending pyroclastic flow can push up the water They are the largest cause of volcanic fatalities. Krakatoa is a good example. The top two of the VC list of dangerous volcanoes both threaten volcanic tsunamis. But so violent and swift were the outragious waves, that pursued one an other, with such vehemencie, and the Waters multiplying so much in so short a time, that in lesse then five houres space, most part of those countreys (and especially the places which lay lowe,) were all overflowen. Five hours is far too long for a tsunami. The Lisbon tsunami came within 15 minutes and that is typical. The lack of a clear cause, and the slow onset, argue that for the 1607 event, no tsunami was to blame. The calculated height of the tides in the Bristol Channel, for January 1607. The peak on 30 January was extremely high. Source: Kevin Horsburgh and Matt Horritt, 2006. But not all spring tides are the same. The Earth is closer to the Sun during winter, and this makes the spring tides notably higher at this time. However, at tat time the Sun is very low in the sky from the northern hemissphere and this mitigates its effect and makes the highest tides come a bit later, February-April. Furthermore, sometimes the Moon is better aligned with the Sun. The net effect was that the tide at 9 am on Jan 30, 1607, was the highest for 4.5 years. It magnified the impact of the surge, as it came on top of an already extreme tide. On the morning of the flood, the tide at Avonsmouth peaked at 7.86 meter above mean level (AOD). This was unusually high. The westerly wind aimed directly at the Bristol channel, raising the water levels by 2 meters or more. For comparison, the storm flood of 31 January 1953 raised the water along the North Sea coast by 3-3.5 meters, but the North Sea is far more susceptible to storm surges. It was not only the force of the wind: the long duration also played an important role. Later that day, the strong wind became easterly (or more likely north easterly), driving the waters back out. There is other evidence that the 1607 flood was a storm surge, rather than a tsunami. Flooding was reported later that same day on the opposite side of the UK, at King’s Lynn in Norfolk, coming in from the North Sea. And also on the oppsite side of the North Sea, a severe northwesterly storm occurred in the northern Netherlands on 30 January, sinking 5 large ships and badly damaging 10 more near Texel, carrying grain to Italy; 170 sailors drowned. The storm also caused flooding in Friesland, where the sea defences broke. None of the reports from the UK describe wind damage, suggesting the winds were not as strong there as in the Netherland. Interesting is that neither do the reports mention heavy rain: it was windy, but not particularly wet weather. Strom surges are caused not only the wind. Low air pressure contributes too, as the lesser pressure allows the water to rise, by about 10 centimeter for every 10 millibars. A deep low-pressure system in the UK may have a central pressure of 960 mbar (even lower is possible), and this can contribute 50 centimeter to the surge. So what actually happened? The long duration of the storm suggests a relatively slow-moving low pressure system, initially north of the Bristol channel, perhaps in the Irish sea. The northwesterly storm in the Netherlands later that day shows that the low pressure moved to Denmark or Scandinavia, rather more rapidly than the leisurely progress before. The problem with this storm track is that the wind in the Bristol Channel would not have become easterly, which one source mentions happened. A possibility is that the North Sea storm was a separate system, a secondary depression which formed south of the UK in the frontal system of the main depression, and moved rapidly around it. synoptic chart for 3 Dec 1994. The weather system led to a minor surge in the Bristol Channel. As an example, here is a synoptic chart for 3 Dec 1994, before a minor surge occurred along the Severn estuary. On this day, the main low pressure system was located south of Iceland, but a minor disturbance had formed to its southwest, and this disturbance rapidly moved around the low pressure system. It did not develop into a major storm. However, this kind of situation could describe the events of 1607, if the secondary disturbance came in north of the Bristol channel, and moved southeast followed by a northeasterly track through the North Sea to Denmark. It would have moved south of the Wash (thus causing northeasterly winds here, leading the flooding at King’s Lynn), and north of the Netherlands causing the northwesterly storm there. The increasing wind may indicate the system deepened along this track. Other possibilities exist, of course. The lack of more weather descriptions from elsewhere in the UK makes it difficult to know exactly what happened, and in any case weather systems are never carbon copies. Flooding in the Severn estuary increases if there is a long ‘fetch’ for the water, meaning wind patterns that sweep up the water from south of Ireland towards the Bristol channel. This can place a low pressure system over Ireland or just to the north. If such a system tracked across the UK, it could have caused the North Sea storm as well. However, this would not predict a change to easterly winds in the Somerset Levels. It is of course possible that this claim, based on a single source, is wrong. Although the UK is fairly well shielded from tsunamis, there have been exceptions. The worst tsunami to hit the UK during its habitation hit Scotland, around 8000 years ago. A big landslide of Norway caused a wall of water 20 meters high which overran much of the Scottish coast, leaving a layer of sand up to half a meter thick. Some of the Shetland islands may have been inundated completely. Further south, the coast was not yet in its current location. In the middle of the North Sea was a marshy, inhabited region known as Dogger bank. Nowadays it is 20 meter below the sea. The bank must have been wiped clean by the tsunami. 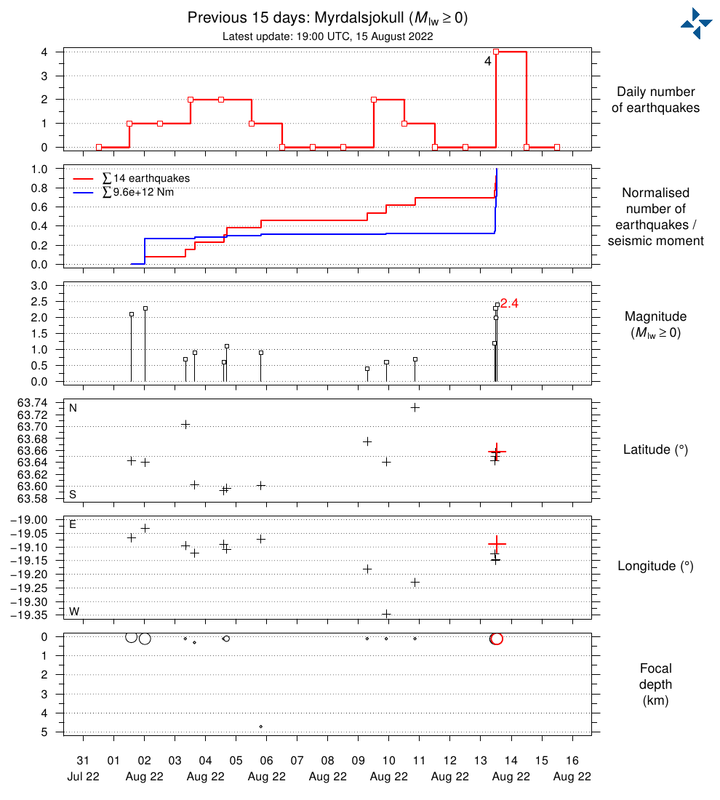 The only other confirmed UK tsunami was in 1755, followed the M8.4 Lisbon earthquake. The tidal wave was 2-3 meters high in Cornwall, but little damage was done as the wave came in at low tide; the wave did not travel further up along the coast. Several other tsunami-like events have been reported, most recently in 2011 and 1929. All appear to be caused by weather. Thunderstorms at sea can push up large waves, which pile up along the coast just like a tsunami. The 1929 wave reportedly reached several meters high, but it hit at low tide. It coincided with a sudden gale. These meteo-tsunamis tend to occur in summer, mainly June or July. What happened before can happen again. Risk analyses must take this into account, and preferably plan for events worse than anything that has already happened. The Bristol channel area is much busier than it was before: more than a million people live near it. The flood defences have improved, and a similar event as in 1607 may be manageable. But could worse happen? Adding an extreme tide an an extreme storm surge gives a possible sea height of 9 meter above AOD at the tip of the Bristol channel. Modeling has been done for such a situation, which in places would overwhelm the existing defences. Extensive flooding around Cardiff and Swansea would occur, and the material loss could exceed 10 billion pound. The question is how realistic such a situation is. 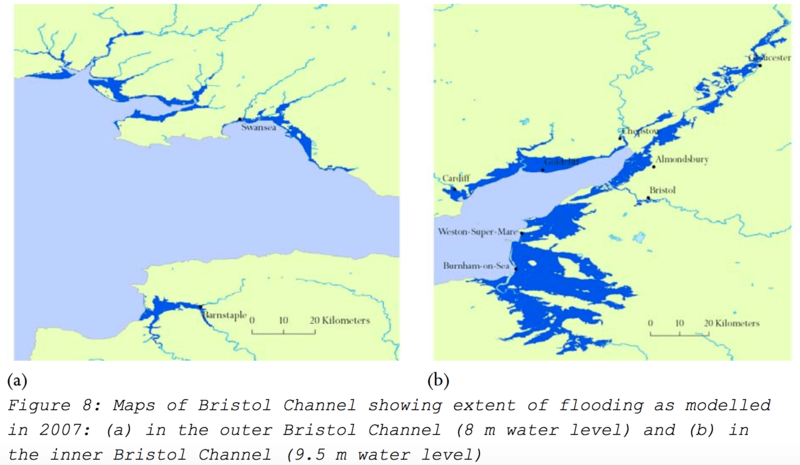 There has been flooding around the Bristol channel a number of times in the past century; in the wet winter of 2014 it was due to the incessant rain, but at other times it was caused by storm surges, the highest of which reached 1.5 meter. The surge level is therefore not out of the question. The danger is when this coincides with a spring tide. Such a coincidence of course is rare. Is the combined risk acceptable? As sea levels rise, the risks increase, and what is rare now may become common within a century. Power stations at Hinkley Point. It is not known why they carry a three-eyed emoji. But now there is more at stake. Somerset is the location of Hinkley point, where a new nuclear power station (Hinkley Point C) is to be build. Power stations need access to water for cooling, and so they are build close to water, but obviously above the flood line. The Hinkley site has a low (but non-zero) flood risk. However, with 0.5 to 1 meter of sea level rise, the flooding risk will become significant. Fingers crossed. After 400 years, the 1607 event remains famous. The idea that it was due to a tsunami does not stand up to scrutiny: it was a storm surge, badly timed to coincide with the highest tide for four years. Even so, the flood marks in the churches are not as high as might have been expected. Is this due to the sea being lower or the land higher 400 years ago? Or are the markers not always correct? There are aspects we do not understand well. It is clear that this could happen again. How good are the defences? In the UK, sea defences are judged on economic benefit. In the Netherlands, they are treated as defensive weapons where any defeat is disastrous. Different attitudes give different outcomes. In the end, it is all about the weather. Whether the sea can conquer the land is up in the air. 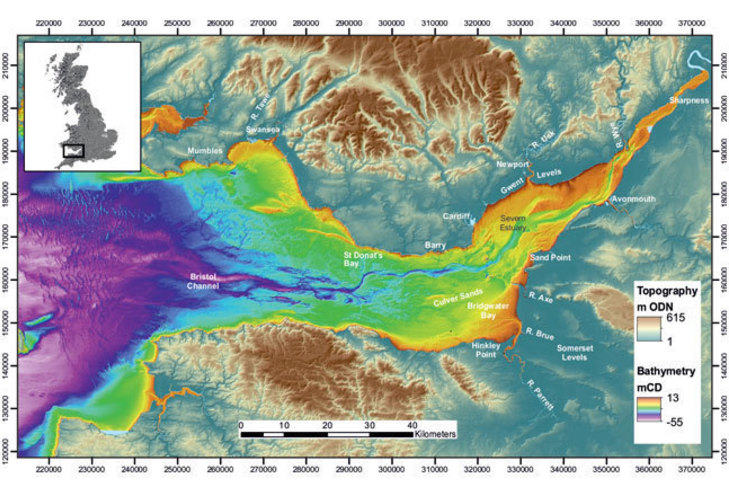 1607 Bristol Channel Floods: 400-Year Retrospective RMS SPECIAL REPORT, 2007. There’s def an uptick in quakes at Öræfajökull, though I’m fairly sure we shouldn’t expect a big boom the next couple of weeks. Anyone got a spitball on how much time before it starts to get really interesting? A year, ten? more? Is there a way for other users to make posts or just admins? Just wondering, because i myself am a poet and am thinking about posting a volcano poem at some point. I’ve been lurking for a while, but alright! of the ice age conditions. Exactly how the Badlands near Seattle were formed! Do you have any details on those stories? and the creation of the natural bridge-and its collapse.. I don’t have time right now, but you know, it might make for an interesting post. I’ve got to finish some things first.. I would love to see a post about that! The North American legends talk about a ‘weeping goddess’ which I take to be a comet, which was said to have passed towards the north, and the Native American flood stories tell about how people only survived if they were above 400 feet high on the mountain sides. There are also cave villages which were once on the edges of lakes, and were abandoned following a drought, which I take as being after the draining of the inland sea and lakes, at a different time. But climate changes at the end of the ice ages also left the cities of Machu Piccu etc in jungles instead of temperate landscapes, or in the Sahara ditto. If the 1600s flood was felt first in the west of the UK, and then in the North Sea it would seem that it originated somewhere in the Atlantic. There are also stories about red haired people living on the East Coast of the US, (Vikings?) who were wiped out by a tsunami too. It would seem that it is not uncommon, whether caused by a volcano, landslip, or impact. go some of my tasks done I will probably not before m,mid-July..
Alyson read a paper some years ago about Eastern Indian DNA .Wife and I both have Native Ancestry . Mine on one side hers on both,,, One thing that this particular paper said there was a fairly significant Northern European component to Eastern Tribes-like the various woodland Indians and Tidewater Tribes. The Welsh discovered America before Columbus and returned to Wales invite further settlers to join them there, so I understand some Welsh words, and coracle boats, may have become integrated into Eastern tribes. I will have to try and rediscover the research I did long ago….. I suppose ‘cant tre’ shortens to cantre means “one hundred town” presumably the rough size of the population – the watchman on the tower in the famous welsh poem below should supposedly have alerted the populace to the flood I guess. O’r golwg dan y dŵr. Yn ddistaw dan y dŵr. I’w clywed dan y dŵr. I think the “hundred” here is perhaps the sub-division of an old county, as per the “Hundred Courts”… precursors, I believe, to the District Courts. As for guest posts, just send an email to us. It’s also possible that one has already been sent to you. As for the storm surge idea… spot on. Tristan de Luna is highly celebrated here for founding Pensacola, but he isn’t what I would call “bright”. He left his ships at anchor in the bay while he and his men went traipsing off after the local tribes in search of gold. While putzing around, a Hurricane made landfall and wiped out his supplies on the ships. They are still finding bits a peices of those ships buried under several hundred years of accumulated sand. Thanks for the interesting article Albert. The guy filming used the T word many times, a ‘bit’ overdone I think. No one was hurt and damage was observed at beach attributes, chairs, cushions and so only. Allthough the weather was calm at the time, it probable was related to bad weather earlier that day. Notice the hPa pressure level graphic in this vid, a comment from a weather channel at the wave. Fast moving bad weather front (90 km/h) did lower and rise the pressure abrupt (nearly 5 hPa), which seemed to have caused the wave. Nothing big here, weather related, striking though. Many people think that the tsunami can only happen with the oceans. As Albert said, tsunamis can be caused by rock avalanches or sliding sediment (which sometimes are in turn triggered by earthquakes). This kind of event can happen also with a lake. This has already happened in Switzerland. 1) In 563, following a rock fall, the area around Lake Geneva was hit by a tidal wave. The wave reached a height of 8 meters in Geneva. “She destroyed mills and the Geneva bridge, killed men and herds and eventually entered the city of Geneva” (historical archive). 2) A Tsunami (4m high wave) occurred in Lake Lucerne on 18 September 1601 following an earthquake of magnitude 6.2 which caused landslides. Fascinating article, Albert. Thank you! Of course the Somerset Levels do not need a tsunami or a flood surge. Bad drainage management, human laziness, and heavy rain caused them to be re-flooded in 2014 and that cost folks a fortune. The whole Severn area will no doubt be hit again. And no doubt the UK Government will remain sitting on its hands. “Nah – won’t happen here” is a national UK Government policy (OK, I am a tad cynical…). Anyhow – many thanks for a great read again! The Great Lakes can also have weather induced flooding, especially Lake Erie. Heavy westerly winds that will cause flooding in the Buffalo area. If the winds suddenly stop, a tsunami like wave will strike the Toledo area. Three or four years ago such a wave did over 2 million dollars in damage and destroyed the Toledo marina. If not for the season, the damage would have been far worse. Released from behind the cookie jar… third gnome on the right. Now back to finish reading the above article. The cause of the flooding of the Somerset Levels in the winter of 2014 was a little more complex than heavy rain. First off, the previous summer had been very wet and the ground hadn’t recovered fully from the flooding at that time. Secondly, on top of the prolonged, heavy rain for around 3 months, there were a number of storm surges, causing overtopping in many areas of SW England, leading to flooding on the south Devon and Cornwall coasts (taking out the main railway line at Dawlish), as well as flooding in Bridgwater. The flooding in Bridgwater was caused by the unusually high, high tide, from the storm surges, causing the streams running into the River Parrett to back up and overtop. After the first event, temporary flood barriers were erected to prevent damage to property and succesfully contained the flooding. The problem with the Somerset Levels, is the millenia of flood management for agriculture. There is evidence of managing the landscape in neolithic times.Many of the village names end in ey or oy,which in Old Norse and Old English means island and there is evidence of the whole area being underwater for long periods. In fact many of the islands in the fjords of Norway have names with similar constructs. All this management has lowered the ground level and it is now below the height of most rivers. There are many artificial and modified river systems, with built up banks. The Levels are often used to prevent flooding of the large towns, such as Bridwgater and Taunton and the arable land is alllowed to flood to some degree for this reason. The problem with 2014, is that the systems could no longer cope. The flood management models indicated, that if dredging was performed, it could move the floods further downstream, with the potential result of the flooding of Bridgwater, affecting many more properties and people. The Levels tend to flood most winters, but 2014 was much worse than usual. Also, because the Parrett is tidal for around 30 miles inland, pumping of the excess water was problematic, as twice a day, the rivers would be too high to receive any further water. After the poiitical storm forced the dredging of the rivers, the first high tide caused real concern and the Environment Agency posted a flood watch throughout the night, as well as reinstating the temporary barriers, as they really thought that Bridgwater would flood as a result of the dredging, even though the tide was expected to be a normal spring tide, without any storm surges. I noticed for months after the dredging that the high tide was higher than it had been previously. Probably by now, with the constant dragging in of sediment by the tide, the silt levels are getting nearly as high as previously, as it would be a constant battle. Like the Severn, the Parrett also gets a tidal bore (although much diminished as it enters from the Bristol Channel) and this strong tide brings in alot of silt. Since the work was done on the flood defences, the systems havne’t been tested, but it will only be a matter of time before similar conditions prevail. One of the major works, which I think will have a big impact, is the creation of a salt marsh and nature reserve near the mouth of the Parrett. When the tide gets above a certain level, it overtops a breach that has been created (or formed naturally?) and floods the marshes. The highest tides in the Parrett can exceed 13 metres above sea level and storm surges can add another 2 metres. Salt marshes are a good idea. They trap sediment, and over time become higher. Of course, behind them you tend to get lakes and marshes. I didn’t know about the islands but am not surprised! This tidal bore also gets surfed, but more for a laugh than the thrill of it. And also because many of the regular bore crew come up from Devon, and the timings for the Severn and Parrett bores are such that it is relatively easy to surf first the Parrett and then the Severn without having to break any speed-related laws on British roads. The Avon may produce a bore in exceptional circumstances, as may the Wye… but despite our exploration even on the largest tides, none of the bore riders (The Severn bore local crew, in effect) have never observed this. A small bore HAS been observed at the very peak of the tidal range, flowing up the Usk around Newport. I’m very grateful for this article. As some of you know, I am (although you could say “semi-retired”) a Severn bore regular, one of the bore riders club. We are all well aware of the stories of the “Great Flood”, and I have a few comments to make. However, I’ve just worked a very successful stall at a festival in 30 celsius or thereabouts, and being also narcoleptic, I had better leave it until I’m rested , and at my erudite best. As is fairly typical for hypertidal estuaries, the silt load in the water, particularly on the English side of the estuary, is massive, particularly around Bridgewater Bay, and then it is also very high indeed the further upstream you go towards Sharpness and Hock Cliff. Dredging operations are therefore of very limited value in the longer term. This is one of the major reasons why the proposals for a Severn Barrage were shelved. Finally got round to read the entire article, nice one, and it answered a question I’ve been wondering about for quite some time, why the hell the tides are so extreme around Bristol, compared to other places. 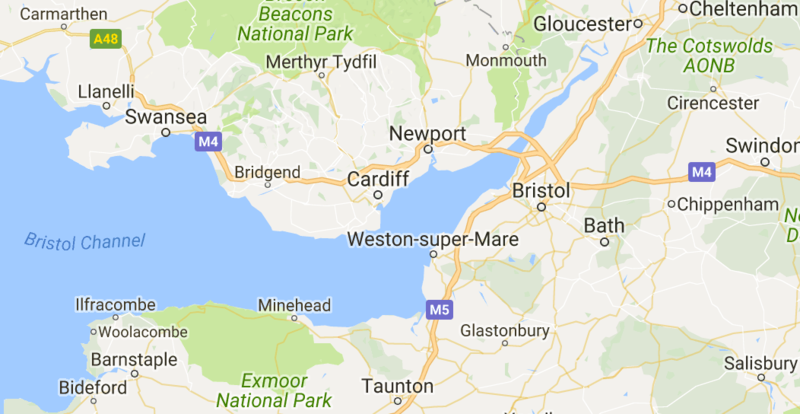 My understanding is that the two landmasses to the north and south of the estuary, Somerset/Devon on the English side, and to the North, the coast of South Wales are presented almost perfectly to catch and then concentrate the incoming tide, which approaches from the South West. Then the narrowing channel, along with the sudden shallowing of the channel around Avonmouth leave the tide with nowhere to go but up. Thanks for another great article, Albert. 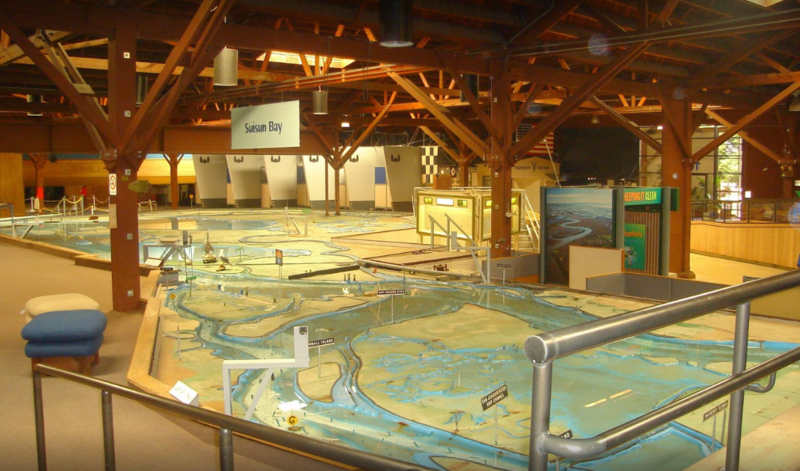 If anyone is ever in the San Francisco area, a visit to the Bay Model Visitor center in Sausalito is fascinating. They try to model tides, pollution distribution, etc over the region. Hey Albert, excellent article as always! I am from the netherlands as you and i never wondered about the word spring tide or spring tij (dutch). It just made sence to me. I doubt it has anything to do with the time of year. Many words between dutch and english are used slightly different in english. From dutch, springen means to jump, and makes sence, going up. A spring is called a veer here. If you open any contraption with a lot of springs in it, Springs will veer off in all kinds of directions when you open them. It is complicated.. the word ‘veer’ comes from the latin word for a spring, but ‘ver’ also means the season, for instance in the latin ‘vernal’, or ‘var’ in scandinavian languages. The word ‘spring’ can mean ‘jump’ but is used for anything that begins to flow (the head of a river can be a ‘spring’), and in fact in general means ‘origin’. So a ‘spring tide’ is the tide at the beginning of the year. Remember that easter falls at the first full moon of the spring season, and this is indeed the time of a spring tide. Another, perhaps older, word for the spring season is ‘lent’ which in english is now used for the time before easter, but in dutch has been retained as name of the season. It is thought to describe the lengthening of the days. Where more than one word exists for the same thing (e.g. sheep and ewe), it shows that several cultures contributed to the language. Which ones those were can be contentious. But we can guess that the proto-european language, coming from the east, would not have had words for the tides, and would have experienced the seasons differently (continental weather tends to go straight from winter to summer within weeks, while near the Atlantic, spring and autumn take up most of the year), so you might expect different words were used.. So lente is related to lengthening? Excellent, i love etymology, Very interesting how the meaning of words changed through time and places. From ‘len’ for longer, and ‘ten’ for day, so ‘longer days’.. At least, that is one hypothesis. spring means “run” in some scandinavian.could be that the vikings brought that in to describe the water coming fast…. In icelandic: springa ;o) still the same as in old-frisian…and swedish. Spring fohlen does that too. But I would have thought “Spring” small river. Little streams that spring to live,or a well that forms a small river or spring. little jumps..
A news site reports on a quake swarm in Yellowstone without resorting to hyperbole or unneeded superlatives. These guys did it right! Sorry if this is thought to be pedantic but there is no such place as Hinckley Point. Hinckley is a market town in SW Leicestershire and is about the middle of England – nowhere near the coast. Hinkley Point, on the coast of the Severn estuary has an old (decommissioned) nuclear power station (Hinkley Point A). Currently there is an operating station with a decommissioning date of 2023 (Hinkley Point B). It is the proposed site of Hinkley Point C.
Not surprisingly, the mistake is common for people who live in Leicestershire! Wiki is correct (had to happen sometime). Google corrects (for me) if Hinckley Point is used. Thanks for pointing this out! I should have caught this myself. My vision is 20:20 but only in hindsight. How true for all of us! I only know because I did technical support work for Hinkley A & B. Small swarm on Loihi Sea Mount with 13 small quakes most at around 7 miles. There are 2 much shallower, one at 2.2 at 1 mile and a 1.7 at 2.2 miles. Thanks for an interesting post. Now, a similar strange tsunami: Allsmost, but only almost, out of the blue. West Greenland today! M4 quake causes tsunami large enough to flood coastal villages and destroy houses. How could this small quake lead to a tsunami???? Landslide would be my guess. Perhaps the tsunami is an indirect effect of the quake, and caused by a large chunk of ice? Based on where the quake was detected, closest glacier calving area, and in what order of severity the various communities that were affected lie around the fjord. A large calving event can be pretty much ruled out. Red X is eyeballed location of the quake. Googlemarker is Nuugaatsiaq the village worst affected. 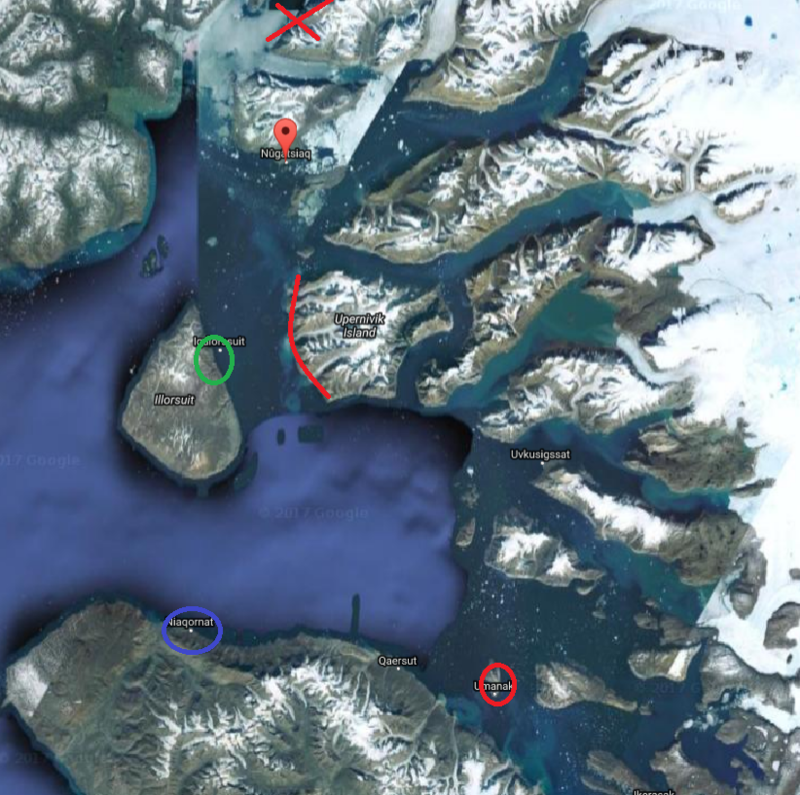 Red circle is Uummannaq, which reported large waves and is more or less 100 km in direct line from Nuugaatsiaq. Green circle is Illorsuit which also reported flooding. Blue circle is Niaqornat where they barely noticed anything. Red line is just coast that the wave would have to travel around. Not an earthquake: something that size should have been on on the USGS list but isn’t. This is the peak time of the year for icequakes, so probably it was that. An icequake is a massive calving event, which happens over minutes rather than seconds so is not listed as an earthquake. The amount of ice involved can easily cause a minor (or even major) tsunami. Is anyone, can anyone, monitor the tsunami currently happening, which has swept away houses on the coast in Greenland in villages 100km apart, according to a post on volcanocafe in Facebook? 101 people are registered to the village, 78 have currently been evacuated, 4 are def missing, 2 are seriously injured and 7 with lighter injuries. 23 are currently unaccounted for, however they may have been out hunting or in other villages. No one is confirmed dead yet though. 11 buildings have washed out to sea, and others have sustained some damages, there’s no electricity as the generator building has been damaged. Katla finally shifts in its fitful sleep once more! Can’t believe it’s almost 9 months since the Yellow alert already! Personally, I doubt it, the clathrate gun is a scary scenario with a potential to be real, but currently the temperature is still below many of the temperatures seen earlier in the holocene. If a runaway clathrate gun scenario were possible at current temperatures, it likely would have occurred during warmer periods than now. The Storegga slides would have been a perfect trigger mechanism. I have a question based on your assertion in the article. Right now, today, we are in a year of relatively small tides, and in June the tides tend to be weaker , as the largest tides tend in most years to be around the equinoxes. And today, we are not even at the monthly peak. And yet at this unremarkable point in the cycle the tidal range at Avonmouth is 8 metres. (high tide 10.84 m, low tide 2.8 m ). At the peak of the range, perhaps with a little help from either or both of the Nodal or Saros cycles, the peak tides will be close to 15 m.
So how come a very VERY average tide of 7.86 m is classed as unusually high? The forecasts for the tidal bore relies on data from Sharpness sill. The UK Environment Agency uses a star system to mark out the potential biggest tidal bores. A one star tide will be 9 meters or above, and this goes up to 5 stars, which will be 10.3 meters (at Sharpness sill). If at tide is 10 meters or above at Sharpness, which is well up the estuary, the same tide will be over 14 meters at Avonmouth. So I’m curious about the height of this tide. Something here doesn’t stack up. I also have a slight query about anything purporting to be a very large tide in January…because that would be very unusual (just a month after a solstice), but I thought this could possibly be some confusion caused by the uncertainty around the calendar at the time. What is VERY interesting to me is that you say that the surge was well in excess of 2 meters on top of the tide. This is interesting for a couple of reasons. I have seen and surfed a tide that was forecast to be 9.9 meters, which was fairly big. I watched the night tide before it from Epney, just South of Gloucester. There was a large storm system coming in from the South West. Many of us were wondering what effect this might have on the wave, and in this case, the effect was very real. I have friends who surf the night tides (I never do), and they were already in the water, committed, when word came through that the surge was coming in with the tide, and that Sharpness sill was showing 10.3 meters and still rising. This effectively turned a 3 star tide into a 5 star beast. I saw it.. It was indeed a beast. The following morning the storm was still producing an effect. I surfed what was expected to be a 10 meter tide…fairly big. It was big, but absolutely brutal…So much power in it ! That sheds some light on the possible impact of a 2m+ surge on the bore. I have witnessed the impact of a 0.5 meter surge (at Sharpness) on the wave, and it is significant. 2m+ at Avonmouth could be very significant indeed…but by my reckoning even that surge on such a modest tide would not be sufficient to produce a flood event. If the tide were 9 meters or above? Yes… Absolutely ! Under such circumstances I would be heading for higher ground if I were in the area. Following that ride I sought out an expert, and there world’s leading tidal bore surfer, Steve King.Not only has he been riding the tides for something like 40 years, but his family have been working the river (mostly running local ferries) for at least 400 years. He lives right on the banks of the river in the village of Saul. Now we had had a much bigger storm approach the UK from the SSW only a year or two before that which had no effect on the wave. I asked him why. He said that to have any significant effect on the wave in the estuary, any storm needed to be positioned 100 miles South of Cork, and needed to be 970 pressure or below. Hence the swell window for the estuary is very small. Now that is not academic data, but subsequent experience has shown that it seems to be true. If I take it as actually being true, then whatever the source of the surge, the direction is pretty specific, and assuming it WAS a storm surge…and I think it probably was, then the centre of the storm was probably around that position, 100 miles South of Cork. One final point I would like to raise, whilst I don’t have any particular reports from specific locations… The extent of the Severn Bore. In 1607 there was no obstruction to the flow of the bore. These days it is normally brought to an abrupt end just North of Gloucester by Maisemore weir. The weir exists for exactly that purpose. For a relatively brief period both Gloucester and even Worcester were regarded as international ports. This was made possible only by the construction of the Sharpness Canal, which effectively bypasses the most powerful part of the Severn bore, and allows shipping access into and out of the river. To this day, it remains dangerous, and the harbourmaster at Sharpness is very strict about letting people into and out of the lock from the harbour into the estuary. The canal was not built until 200 years after this event, though. When the tides are large ( 10 meters or over AND the river is high due to rainfall, we know that the wave will continue over the weir for several miles, although as the weir makes the river deeper than would otherwise be the case, the wave is too gentle to be surfable beyond Maisemore….and the activity is specifically banned by the Port of Gloucester above the weir anyway. As to how far the surge may have travelled? A friend of mine was once the lock keeper at Tewkesbury, and he tells me that on any large tide (which will always overtop Maisemore weir…eventually) even if no surge is visible, the huge lock gates just South of Tewkesbury would always deliver a loud “Boom” when the tide arrived. So I think significant flooding as far upstream as Tewkesbury is certainly a possibility. That is interesting! That is a bit south of the track I had in mind for the secondary disturbance, proposed in the post. It explains why the wind would have gone east later that day. The 7.8 m tide is above mean, not full range. The full range would have have been twice that, over 15 meters. If you look at the plot of the tide above, you see how quickly the range increases towards Jan 30. A week before, the tide was within the range you mention. It doubles in a week, even without any storm. I had been wondering about the effect of the surge on the bore. Tewkesbury certainly sounds possible – it floods for all kind of reasons- but no mention of flooding there was made for 1607. The strength of the bore depends on the flow of the river: high flow means less bore, so if the water levels were already high, perhaps it didn’t get as far. I would assume though that in many places along the Severn, the bore would have caused severe damage. I mention that height of the tide for 2 reasons. Firstly, the normal (modern) charts give readings stated as “AOD”, so I assumed that to be the same datum point… which may not actually be the case. But that still leaves me with a rather large question over the data. A 15 metre tide in January is , to my knowledge, completely unheard of. This is a problem I have always had with the 1607 event… The statement that an exceptionally large tide was expected… In January? Not to put too fine a point on it, this never happens. It is typical for the daily high points to increase very rapidly day on day as the spring tide approaches, which is what is shown ,as you state , in the graphic of the daily tide heights. I assume you meant that the tide doubles in height in the week BEFORE A SPRING TIDE, rather than before a storm ? As to the effect of river level on the strength of the bore being reduced by a high river level… This is incorrect. At least it is partially, but significantly incorrect. The bore is a massively nuanced phenomenon. For safety reasons I will not mention certain things and certain places.. You’d be amazed at the lengths surfers will go to, to find a better, or quieter wave, and some sections of the bore require a skill set that the average surfer just does not have, such as spotting and negotiating quicksand, and extricating oneself from very large whirlpools…. So for the sake of convenience and safety, I will say that the bore area (at least in terms of a surfable wave ) starts at Arlingham, and ends at Maisemore Weir . Over the course of this journey there are two distinct types of estuarine landscape. The lower part is classic estuary, with shallow channels, wading birds (at low tide) and extensive mud and sandflats. The upper part looks very similar to the look of the river much further upstream, in places such as Worcester. The lower areas will often have a bank-to-bank width at high tide in excess of 500 meters, whereas the upper areas… from about the Severn Bore Inn at Minsterworth, the river is about 70-100 meters across with no mudflats. In conditions of high outward flow from the river, if the tide is big, the bore will be exceptionally powerful here, but will quickly lose power once into the narrower, deeper sections past the Severn Bore Inn. This is because the increased weight and moment of the outflow will hold back the head wave of the tide, which therefore piles up as the incoming tide catches up with it, creating a bigger and vastly more energetic wave. I should also point out that the wave itself holds much more energy than a similar sized wave in normal coastal conditions. This is due to the body of water pushing it in being several miles thick, as opposed to a regular beach wave which is at best only tens of meters thick. There is a saying amongst the surfers about where to expect the best waves in any given conditions. If the river is high, go low (go lower down… to seaward). If the river is low, go high (further inland toward Maisemore). Example of how much energy is in the wave… April 2009, surfing near the Severn Bore Inn, a knee high wave smashed me into the riverbank… 3 rounds of surgery, a broken arm and almost an ending of my musical career gave me an object lesson in having respect for the power of the tide. As an example of a big tide in high water conditions at Arlingham, this is a video I shot some years ago. This, particularly the last 30 seconds, is classed as a very good wave for this section of the river. Wrong video ! This is the correct one ! Thanks Albert. I didn’t know that, but it makes sense, and yes 14.83 would be very close to the top of the normal range. An additional 2+ meters , whilst it may not sound like a lot, on a narrowing channel is very significant indeed, and certainly enough to represent a very serious flood risk. For this reason, we can count ourselves very lucky that the 2007 floods occurred in July, in between 2 weak spring tides. I think our last posts crossed, btw. A high tide of 7.86 meter above mean level would mean a tidal range of 15.76 meter, would it not? So, close to the maximum you mentioned, and not at all average. Maybe we have a misunderstanding of the terms here? The datum point , for all the time I’ve been using the tide charts for the estuary, has always referred to mean low tide, so a tide of 7.86 meters would give a range of roughly 7.86 meters , depending on actual low tide level and pre-existing state of the the freshwater level..
And as I said, a tide of anywhere near the maximum extent of the range would be unheard of in January. I had to look this up. The datum point you have is chart datum, which is defined as the lowest normal tide, and is specific to one area. OD is for ordnance datum which is a uniform system across the UK, defined as the mean sea level somewhere in Cornwall. It is normally used for heights on land. There are tables available which lists the difference between the two. For Avonmouth, OD is 6.5 meters above chart datum (http://www.ntslf.org/tides/datum). The plot of tide height shown in the post uses a different system again: it has defined zero as the mean between high and low tide at Avonmouth. The mean sea level at Avonmouth is 53 centimeter above OD (as of 2016: this is 3cm higher than in the 1990’s (http://www.psmsl.org/data/obtaining/stations/257.php)), so you have to add 53cm to the 6.5 m.
The 1607 tide in terms of chart datum becomes 6.5+0.53+7.85=14.83m. This is within 20cm of the highest possible level excluding any surges. The sea level is rising at a bit over 2mm per year, and the rise at Avonmouth since the 1990’s agrees with this. But I don’t know whether there are any local effects which need to be taken into account. The paper which gave the tide calculations gives no information on how these were done. So, some effect we can attribute to the 18.6 year nodal cycle perhaps? Or something similar? That would make some kind of sense. There was another extreme tide in September 1922 (but no storm surge) which is 17 times 18.6 years after Jan 1607.. Of course, am 18.6 year cycle does not repeat the same time of the year. That takes a 93 year period. I would add that the 31 March 1761 Off-Portugal earthquake, a delayed aftershock of Lisbon 1755 but a significant quake in its own right, did cause runup in Cornwall. I think 1607 was a significant storm/neap tide though. A floating house after the Greenland tsunami. Currently, reports attribute it to a landslide althought don’t think anyone has identified it yet. Interesting how the wave propagated around corners and hit distant shores! The Öræfajökull graph I posted at the top needs to be expanded, the accumulated amount of quakes has hit the top(and I’m fairly sure there have already been more than there’s room for), highest accumulated amount of quakes in a month since december 2005, and the month is far from over. I did know the term. But the Ozzie king tides are spread a bit more randomly through the year, depending on exactly where you are. The tides in Australia are not particularly high and small changes can move the date of King tide to an entirely different season. The ‘best’ tides are around 50 degrees north or south (that has to be with an ocean resonance), and in the southern hemisphere there is almost nothing there. Australia is much closer to the equator. Oh look, rain. That explains why that frog next door won’t shut up. …anf it’s almost 5 am local… no sleep yet. Ambien, no luck. Still wired. Time for the sure fire way of dozing off. Absolut and lime. Same here, and to top it off I put some coke with my whiskey, caffeine kept me up all night, and 15 bulldozers-trucks all around me, hope to sell soon. I think the frogs might be up for a few days with the weather comming. wasn’t there a tv docu on this a few weeks ago. they ruled out anything tidal or storm surge (witness accounts suggest it was clear nice day), due to what was in the layers of silt, that indicated a tsunami. The final conclusion (hypothesis), was a large earthquake sw of the Irish coast on a known fault that fairly recently produced at 4m+ quake! That was based on Simon Haslett’s work. Whilst I respect him as an academic, he got this one wrong.You don’t need to be directly affected by a storm to get the surge, and has been said, with a long fetch, waves arrive at a location better organised (Surfers would say “clean lines”) and therefore with more focused power. But the real tell-tale is the timing. Storm surges tend to arrive with the incoming tide. Many people fail to understand the extreme energy of pretty much any tidal bore. This is the largest in Europe, and always carries an extreme silt load. It has been calculated that at any one time there is around 50,000 tonnes of silt in suspension moving into and out of the upper end of this estuary (Source, Dr Graham Daborn, Acadia Center for Estuarine Research). This silt typically comes from various areas of ongoing erosion, with Bridgewater Bay being a major contributor. Some of it is moving Northwards to Wales as part of a larger scale pattern of longshore drift from North Devon, and at any one time there is about 10,000 tonnes in the upper estuary that has been carried downstream out of the river system. My interest in the data surrounding this started when I spotted what I believed to be a smear of Evesham series marl on the edge of an area of sinking sand. This was shortly after the floods that occurred in the Midlands in 2007. That was a soil I knew well, as I had studied it as part of my Royal Horticultural Society college course. I say there is “typically” silt of these types and quantities in the area, but I would qualify that by saying that whatever the cause, it was not typical in any way, shape or form. But didn’t they base their conclusion on the fact, the shells they found came from a deep water source, that is not possible with storm surge! Hence I said “due to what was found in the layer of silt” not referencing the thickness of silt! There are many means by which different deposits can end up in particular locations, not just tsunami. I would venture to say that Haslett et al need to show that they were initially brought up from depth and delivered all the way into the estuary by one singular event, that event being a tsunami. As they have not to my knowledge done so, I would say the evidence (of the shells) is circumstantial at best, given that there seems to be a considerable weight of evidence against tsunami being the cause of this flood. Personally, I don’t think the door is COMPLETELY shut against the tsunami hypothesis. There are still unanswered questions for me. The surge doing such damage around Barnstaple, for one. That is outside the area wherein the effect of tide and surge is amplified by the bathymetry. I have also seen accounts in the past which claim that areas around Pembrokeshire… well North of the estuary.. were also flooded. And I still find a tide that large in January … to be completely honest I really have to question that data. The biggest tide in over 4 years? No. At present, I find that lacks credibility, the more I think about it. I need to see more evidence to back that up. I think we have conclusively ruled that out. It was a Europe-wide storm. The account of a ‘clear day’ is from one pamphlet written by someone in London, i.e. not a eye witness. All other accounts mention the wind. You just can’t trust those tv documentaries any longer! I must confess, I remain highly unconvinced by the large tide in January. I’ll do a little digging and see if I can find any corroboration for it. I simply cannot recall even unconfirmed rumours of a tide of that magnitude ever happening in January… or within a month of either solstice. For me, it’s the only fly in the ointment as far as the storm surge hypothesis goes. I have to be honest…… And sorry for posting so much on this one. It’s obviously an area of specific interest for me, so I hope you find my contributions useful. Ok, to be honest, the more I look at it, the more the storm surge hypothesis as currently expressed is beginning to come apart for me. mostly for the reasons given in my most recent response to James Barlow, above. I’m still inclined to think storm surge is the most likely contender… but biggest tide in over 4 years? In January ? Not credible ! Not at present. I am far more likely to believe that there was human error in the data/ report being quoted, because a tidal range of 7-8 metres is exactly what you would expect in January. Not double that value ! I will go as far as to say “Go ask anyone who knows the estuary”. I DID ask Steve King, and he thinks it’s just about possible, with Sun, Moon, and maybe a couple of other alignments all being favourable. But it is , to my knowledge, unheard of in living memory that the biggest tide in over 4 years would fall in January. Exceptional in the extreme. The paper that gives the model heights has no detail on how it was calculated. The tsunami idea is not viable: there is no cause, and there is no model that predicts it will hit these areas and nowhere else. There was definitely a storm surge. The storm is documented, and it hit not just the Bristol channel but also the Wash and the Netherlands. In the latter, it is a well documented disaster caused by the northwestern storm. Therefore, the discussion is about the height of the underlying tide. Note that the flood marks on the churches are a bit lower than the model predicted. The proposed solutions are not fully convincing, and perhaps the tide+surge was a bit lower than they calculated. As no details are given, this can’t be judged. No “reply” tab under Albert’s post (16.57), hence. I agree, for a tsunami, we must have a source, and we don’t. Therefore storm surge remains far and away the strongest probability for the cause. The reason I have such a bee in my bonnet about the tide is that if the tide was truly of fairly average height, or even moderately higher, the the surge must have been not just very big, but almost unprecedented, to make up the extra water required to generate such a surge. 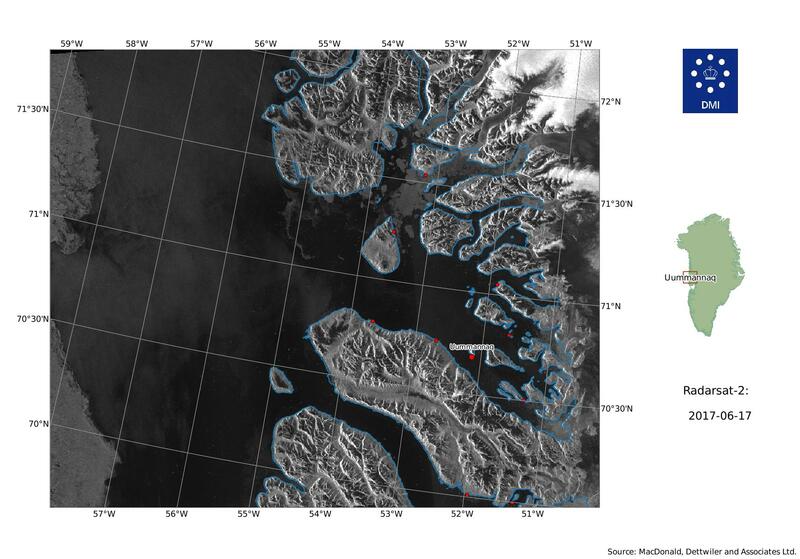 Here is a Sentinel image of the area of the Greenland tsunami, taken yesterday. 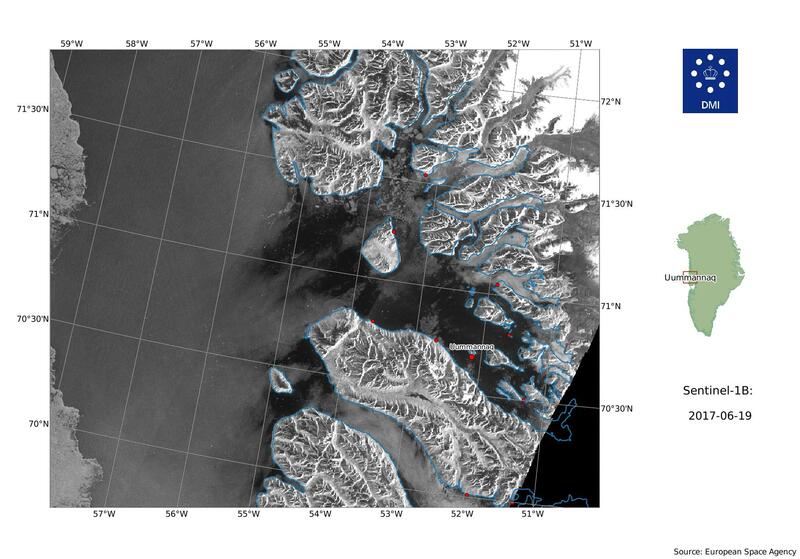 It seems like the location of the landslide is still enclosed in sea ice. Are we sure that it is the right land slide? From the location of the affected villages, it would make more sense if the wave came from the sea arm to the east of Nuugaatsiac. However eyewitness accounts from the area corroborate pretty well with the location, both in direction from where the wave came from, but also of hearing “thunder” and seeing a massive dustcloud moments before(and in the video of the area, it hasn’t dissipated 100%). Also, if you look at the same satelite photo from two days before, then it is pretty clear that it’s driftice, and the large sheets/collections of ice around the village have been disintegrated and shunted westward in your pic. The area which is in danger of falling, has moved 50-100m, and considering it is facing south makes it even more prone to being influenced by environmental factors, such as constant sun melting whatever permafrost there might be and so lubricating things. If it will fall tonight or in 10 years is however the big question, there is however little doubt that it will fall. The seabed seems deepest towards the villages. In fact the wave would have bend away from that direction. It bends towards shallower seas, where the wave moves a bit slower. Perhaps the wave reflected of the islands. Yay… its a storm now. It hasn’t had the time to spin up very much, but it’s dumping water as they are all prone to do. The actual center will landfall off to the west, prob in Louisiana. Edit Add: Reportedly, the upper level low over Texas is putting too much sheer on Cindy for it to develop much more. That’s keeping the storm pushed off the center of circulation. It’s essentially nothing more than a water pump now… and the High over Tennessee is gonna keep it stationary for now. Word of advice. Don’t go swimming along the northern Gulf Coast. Persistent onshore winds make conditions ripe for rip currents. If you are an idiot and do swim there, if you find yourself in a rip, (being pushed out to sea no matter how hard you swim.) then swim parallel to the coast until you leave the rip. That’s about the only sympathy I have for you. Being an idiot and swimming in conditions like this are what put the life savers lives in danger. The USCG is good, but not every lost swimmer is found. It is very hard to see a little head bobbing around on the open ocean. But, rest assured, you will be found… eventually. Bodies around here tend to wash back ashore within a week or so. As expected… lots of rain. “News” idjits are screaming bloody murder over potential flash flooding, but other than an almost full retention pond nearby, I don’t see anything out of the ordinary. Nearby old Palafox, which I have seen with a foot of water over it is still well above the level in the ditches. This particular area is around 140+ feet above sea level, so unless something clogs up the drainage, it stays mostly dry. Wife is alarmed that we are under a tornado watch… but that is also normal for landfalling systems. We are under what would have wound up being a healthy feeder band, so the dynamics for fast spin up tornadoes are there, but I don’t see any particularly impressive cells embeded in it. Maybe 34k ft cloud tops here and there. Vapid reporters of America… Suits require a bib so the drool doesn’t mess up the jacket. I hear that they have their own specialized smartphone app that reminds them to breath. The swarm at Yellowstone now at 460 earthquakes. The movement of two sides of a crustal segment moving away from each other. This thins the crust and reduces the stress on already hot rock underneath… which can decompress and begin melting, forming magma that migrates to the surface and fills in any cracks and voids that form from the spreading. Sorry for the stilted response. I’m highly ticked off right now at the local media hyping this storm… plus the never ending emergency alerts that keep breaking in with their high dB klaxon sound. Yeah, it’s dangerous. We know. Mixed in with that was an Amber alert, but they found her (safe). That’s a lot of quakes lately in Katla, not to mention in Yellowstone as well. But the risks associated with them are obviously different. Yellowstone eruption would be a big national catastrophe for the States. That’s not strictly true. The majority have been very shallow – but we’re also seeing a few deeper quakes now; the deepest has been 25km. As for the shallow quakes well ice quakes have a different signature and aren’t so well located; the shallow quakes are more likely to be hydrothermal. But something is driving them. Looks like a slight intrusion combined with some melting this time. I guess there’s a few cobwebs to blow off. Found some lunar orbit calculator. On Jan 27, 1606, the moon was at perigee (closest distance to Earth) almost exactly during new Moon (within 12 hours). That already helps increasing the tides. It also so happens that this perigee was rather close, at 357045km. Not the closest one possible, but pretty good. For comparison, in 2016 we had the closest moon since the 1940’s and this was at 356,509 km. At the other extreme, sometimes perigee is over 370,000 km. The difference may seems small, but the tidal force goes at the inverse cube of the distance. The different apogees makes a difference of 10% in the tidal force. Apparently, a coincidence between closest perigee and spring tide is called a Proxigean Spring Tide. I had no idea. Now the storm surge was 3.5 days after thew new moon. A quick look at the tide tables shows that indeed, there is some lag and tides remain high for this long. On Jan 31, the Moon was above the equator.I don’t know how important this is but perhaps it helped. There is a program available at admiralty (easytide) which can calculate the heights of the tides at any time. I haven’t used it as it requires some money to be out in, but if anyone has access, perhaps they can give it a try! Thanks Albert…and sorry for making you work so hard ! I’ve spent the morning looking around the web for other means of looking at historic tide data with no particular success, so I think this has just become a longer term project for me, particularly after reading the Horsburgh and Horritt material, because those circumstances were either much more unusual than I expected (re: tide), or something has changed… and I would like to understand what’s going on. About extent of flooding up the estuary. As there are accounts of the river already being high, and possibly in flood, it could well be that the fresh water level effectively plugged the estuary, in which case, as I said earlier, there would be a point of equilibrium somewhere, possibly around Minsterworth, where the wave may be exceptionally large and powerful, but would also give up a lot of its energy such that it may not have progressed much farther upstream. Something else which Steve King mentioned as a distinct possibility, after reading through the material, also seems possible. Yes, there is some form of drag at play which normally results in the highest tide falling some 2-3 days after the full or new moon. Quake on Hawaii. 4.5 at 27 miles deep in a new area west of Lo ihi sea mount. News organisations across the US received the emailed alert about the quake [..]Few organisations reacted directly to the news because it was dated 29 June 2025 – exactly 100 years after the actual event took place. The LA Times, which uses AI-based software to automatically write up the USGS alerts, did issue a news story based on the alarm notice. After the large Kilauea earthquake, Mauna Loa showed a jump in the crater GPS. After the recent M4, that jump has reversed. The second earthquake may have resolved stress caused by the first one. HVO has commented on the on-going earthquake activity at Lo’ihi. It is considered magmatic, but the number of earthquakes is not as high (yet) as during the 1996 eruption. It is not easy to know whether a volcano a kilometer below the sea is erupting! I guess that if the activity increases, it could signal an eruption.